But although my parents did not garden, they did compost. From the time I can remember, we collected our food scraps in a big joint compound bucket that sat next to the kitchen stove. When it was full, one of us (far too often, me) would lug it out to the compost heap and dump it on the pile (in the wintertime, these new "offerings" would give off considerable amounts of steam), then wash the bucket with the hose before bringing it back inside. Since city living is not very compost-friendly, it's been many years since I've been able to compost. 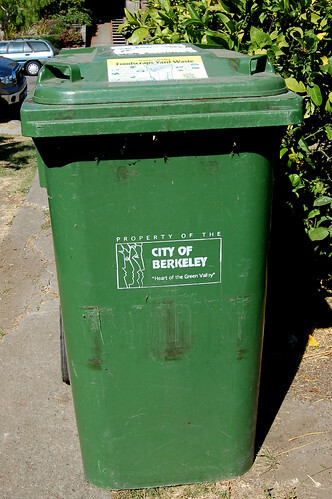 But last fall, Berkeley got with the program and adopted a wonderful curbside composting program. 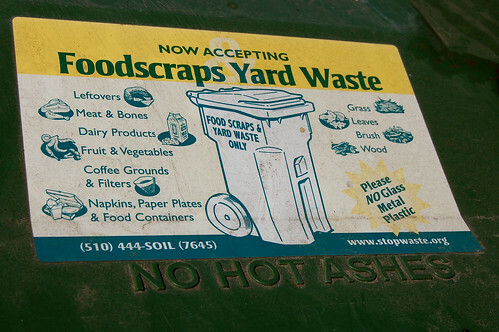 We collect all our food scraps (including meat, bones, soiled paper towels, butter wrappers, etc.) in a small green bin the city provided for use in the kitchen, then dump them into a larger green bin outside that the city picks up once a week on the same day it collects garbage and recycling. The food scraps and other plant debris are then taken to a huge composting facility nearby where they sift it, sort out any glass or plastic (apparently, they pay people to walk through the huge piles, plucking out any unwanted items - what a job, huh? ), grind down any large pieces, and heap it into enormous compost piles that are 50 yards long and 5 feet high! Here's a picture of the steaming piles. 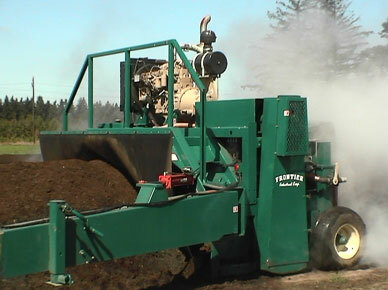 The facility uses a specially designed machine on wheels to turn the compost and add water to keep it moist. Two and a half months later, the piles of rotting food have become black gold -- a crumbly, dark brown, nitrogen-rich soil. 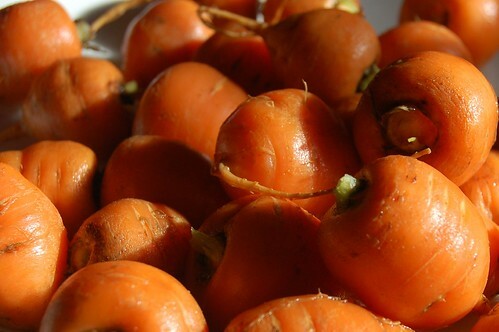 The city then sells this soil to local farms (I just found out that Eat Well, one of my favorite Bay Area farms, uses it! ), donates it to local community gardening clubs, and uses it in city landscaping projects. Although it's not as environmentally-friendly (or satisfying!) 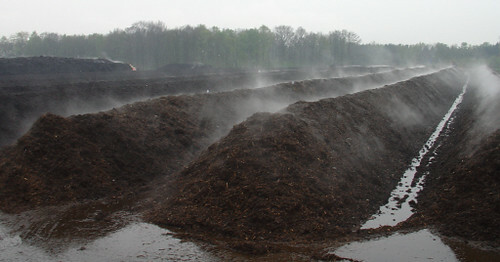 as composting at home since the process requires a good deal of diesel fuel to truck the food scraps to the facility and to run the huge machines required to sort, grind, turn and water the waste, it is a great way to significantly cut down on landfill usage and to create rich soil for locally-grown food and city landscaping projects. It's also a money saver since it costs the city less to compost food scraps than to dump them in a landfill and the revenue from soil sales also helps offset the costs of composting. If you have a yard or outdoor space available, I would recommend starting your own compost heap (I hope to do a post on home composting soon.) But if you live in an apartment and don't have any outdoor space, and your town or city does not already offer a curbside composting program, ask them to start one today! There are lots of good examples out there to copy. Here is a link to the city of Berkeley's web page on the program. And here is a link to an article about how the process works. I am surprised to hear about the meat and bones being included. I thought I needed to steer (get it?!) clear of protein sources in my compost. Is that just because it is a commercial, high-heat compost that can break those down? this is wonderful; so totally ENCOURAGING!!!! i'm living in upstate new york, and my current composting effort is the gathering of vegetable-only scraps and shlepping them to the edge of my rented-house's yard, where i leave them next to a large gopher hole. SOMEBODY eats them (have seen turkeys, rabbits, squirrels, crows and the like out there, too)! i guess it's a start... thanks so much for featuring this important subject! c'mon, everybody: let's COMPOST!